LA Golden Slipper-WET hope we get some SUNLIGHT. 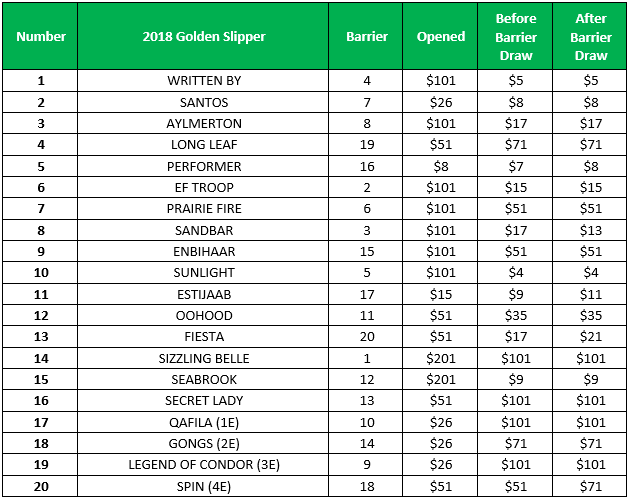 Sunlight appears set to into Saturday’s Longines Golden Slipper (1200 metres) as favourite at Rosehill. The Magic Millions winner has been at the top of the market for some time and after Tuesday’s barrier draw, was installed $4 favourite after coming up with gate five. She will be pressed for favouritism by Written By though who is $5 into as low as $4.60 and has attracted some big bets too. Sunlight heads into the race with five wins and a placing from her six career starts. The daughter of Zoustar was ultra impressive in winning the Magic Millions back in January and rounded out her Slipper preparation with an effortless victory in the Magic Night Stakes last week. Written By announced himself as a Slipper contender when he thrashed the field in the Blue Diamond Stakes back in late February, with trainer Grahame Begg giving him a final hitout in last week’s Pago Pago Stakes to get him ready for this. Although pressed by Sandbar for most of the straight, Written By made it four wins from as many starts. Of the others, Santos ($8), Seabrook ($8.50) and one-time race favourite Performer ($9.50) are the only other runners in single figures. The Longines Golden Slipper is race seven on the card at Rosehill this weekend and is set to jump at 4:10pm AEDT. Racing in HK and on the mainland. Horse racing and gambling were popular in China for the first few thousand years of human life on earth. Over the past half-century, though, anti-gambling laws marooned the sport. Today, mainland China sees few races, slow horses and a black hole that eats bright-eyed investors alive and produces boneyards of abandoned dreams and a few ghostly racetracks. Ren Ningning is the latest newcomer. He made his fortune selling concrete. Now, he is pouring that money into horse racing. By his own account, he has already sunk millions into his new pet venture. Ren owns more than 50 Australian thoroughbreds, including expensive broodmares, and runs two stables. His slow-building plan: to breed and sell world class horses inside China. It remains unclear where all those horses would race. There are strict, slow, and expensive protocols to move horses in and out of the Chinese mainland. Before entering Australia, for example, any China-based horse must first spend six months or more in an approved buffer zone, such as New Zealand. Only about 60 small races run each year across the expanse of China, compared to 740 between the Hong Kong Jockey Club’s two tracks among the dense, vertical city. The Hong Kong Jockey Club profited $27.67 USD million last year, breaking the previous year’s record. The potential profits of those numbers with the population found in mainland cities turns heads and then cracks skulls. If Ren decides to hang up the saddle, he wouldn’t be the first victim or the last. The stereotype of China’s wealthy as buy-happy showboats is a global vision so strong it can sell horse racing as a profitable business without any gambling — which would be a first. After the Republic of China banned horse racing in 1945, a decision upheld after the communist revolution by the People’s Republic, racing only lived on in traditional communities on the steppes near the Mongolian border or in the far west. The British Shanghai Race Club, once the world’s most extravagant, is now an art museum. In China today, horse racing tends to evoke stink eyes leveled at rural ethnic minority communities or complicated emotions from a society recently liberated from colonization. When Byron Constable, a British IT entrepreneur, bought the lapsed copyright to The Shanghai Race Club in 2009, he planned to parlay the name into a luxury brand. Horses would be the new Ferraris. Constable banked on the idea that rich Chinese swarm to decadence. He threw swanky parties festooned by wide-brimmed hats. The attached web platform, PaoMa.com, live-streamed video, fed from the United Kingdom by popular British racing site AtTheRaces.com. Members could “book a horse,” purchasing the animal only for race day and taking half the profits. Because the ownership rights transferred, it wasn’t gambling. By Constable’s measure, half-a-million viewers tuned in each month. But few bought horses. He sold six, two to himself. At $25,000 a horse, the actual sales never met the predestined hype. Today, PaoMa.com features pixelated simulations of cartoon horse races on repeat. Someone could, if their life had gotten to this point, bet on non-existent digital horses with soundbites of whinnies and hoofbeats nickering through the computer speakers. Spectators at race night at the Hong Kong Jockey Club in the Happy Valley district of Hong Kong. Even with such success, the allure of a foothold in China beckons. After announcing a 2014 deal to open a training facility just across the border near Guangzhou, the Hong Kong Jockey Club became first in line if anti-gambling laws weaken. But they since admitted they underestimated the mainland’s bureaucratic jungle gym. The 2017 opening date moved to 2018. And on October 2, Australian authorities changed Hong Kong’s quarantine status, accounting for the change in biological environment due to horses visiting the mainland. Profits are already affected — Australia-bound horses stalled in Hong Kong’s limited stables now await new travel plans. As early as Longines Hong Kong Cup in December, the club will begin to see downstream effects. Thus far, Ren only sells horses to a small handful of acquaintances and races the odd event. If his idiosyncratic vision holds any graces, it’s his impressively low ambitions. Ren’s interests sound less like commercial gambits or cultural revivals, and more like personal whims. If his eyes gaze less beguilingly than his predecessors, and his hands remain full of billions of dollars, he may have a chance to stay in business. But if Ren wants to move forward, the problem remains: No one is quite sure how. LA going HONKER’S watch the page as we will be doing LA Raters for the HONG KONG races. So we will be doing the same format done here, collating and rating the fastest from HK. For both tracks, Happy Valley and Sha Tin. Horse racing in Hong Kong is quite neat and orderly as horses are rated on a sliding scale. In other words every horse that races in Hong Kong has a number rating associated with it. The lower the rating the less quality is associated with that animal, a high rating means a high quality racehorse. An example would be that a horse with a 39 rating would have much less ability than a runner rated 81. Every race in Hong Kong is rated by class. Class 1 & premier class races are the highest. With class 5 being the lowest quality animals. A class 3 event would be somewhere in the middle. Nearly every race in Hong Kong is a handicap event which means that horses are weighted according to their ability. This means that the horse with the highest rating in the race will carry the most weight. With the lowest rated runner carrying the least amount of weight. The amount of weight is set by the track handicapper who keeps tabs on all horses and continues to rate them on each performance they turn in. This makes racing in Hong Kong very competitive and therefore entertaining. The weights carried can be much more significant than in the United States. Top horses can often be weighted around 130 +, while lower quality horses in the same race may only have to carry around 115. The exception to the handicap weights are in stakes races where the runners all carry the same amount of weight. There is one more class of races in Hong Kong. They are the Griffin events, a Griffin race is basically equivalent to a maiden race in the United States. They are for horses who have never won a race before. A Griffin is defined in Hong Kong as a horse that is imported to Hong Kong unraced. Now you may have a better understanding of the classes and how they work in Hong Kong. Below I teach you how to read the class & horse ratings. RACE 4 – 2:30 p.m. The class for each race is specified. This race is the Endeavour Handicap, it is a Class 4 race. This means that the race is only for Class 4 horses. Horses eligible to run are between Ratings of 52 – 32. The rating for each horse is listed under the column marked Rtg. As you can see the horses are assigned weights according to their rating. For example horse #2 Plenty Of Surprise is rated 52. He is assigned a weight of 132. While horse #14 A Run Of Luck being rated only 33 is only assigned a weight of 113. So #2 Plenty Of Surprise being a higher rated horse is forced to carry more weight in a handicap event. In all handicaps the maximum top weight shall be 133 lb and the minimum weight shall not be less than 113 lb. Northern Hemisphere-bred and Southern Hemisphere-bred 2-year-olds (as at 31st December) will receive a 5lb weight-for-age allowance in all handicaps, where applicable. Horses which are entitled to a 5lb weight-for-age allowance may be entered in handicap races for which the published upper rating limit is up to and including 5lb below their handicap rating. The maximum rating increase for horses placed second to fifth shall be 5 rating points in handicap races, and 10 rating points in non-handicap races. No rating increase will be made to horses finishing sixth or lower in any race. Ratings will be allocated based on the Hong Kong Jockey Club Handicappers’ assessment of overseas performance. a. PPG and ISG which are 3 years old on 31st December will be allocated a rating of 57 (Northern Hemisphere-bred) or 52 (Southern Hemisphere-bred) on arrival. b. Southern Hemisphere-bred PPG and ISG who are 2 years old on 31st December will race in Griffin races. c. Northern Hemisphere-bred PPG and ISG which are 2 years old on 31st December will also be eligible to race in Griffin races. In addition, from 1st January, they will be eligible to race in class handicaps. A Northern Hemisphere PPG or ISG which is entered for a handicap will be allocated a handicap rating at the time of entry. The initial rating will be 57 if the horse has not raced, but may be amended if the horse has raced. Once allocated a rating, these Northern Hemisphere-bred horses are not eligible for Griffin races, unless otherwise specified in the conditions of the race. d. A winner of two Griffin races will be allocated a rating immediately. e. After 1st June, a trainer has the option to request that a rating be allocated to a horse that has won a Griffin race. f. No horse allocated a rating is eligible for Griffin races unless otherwise specified in the conditions of the race. 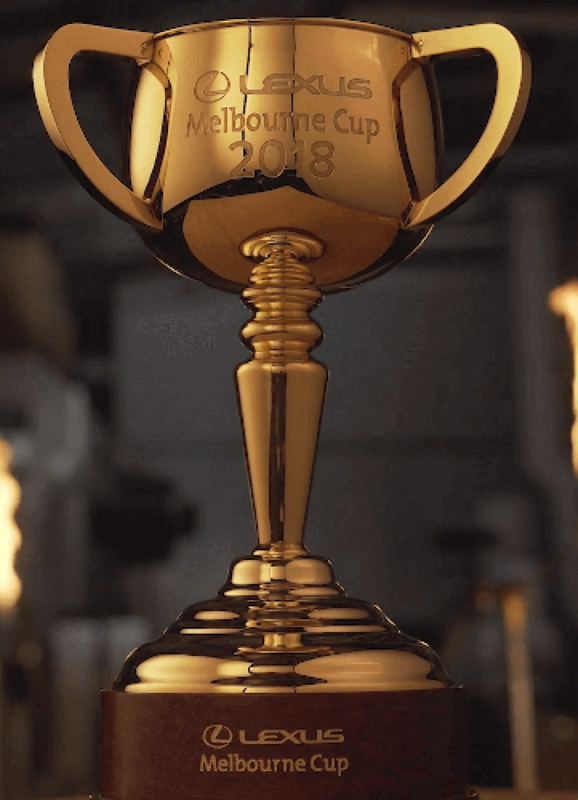 g. The initial minimum rating allocated to a Griffin winner will be 60 for Northern Hemisphere 3-year-olds and 55 for Southern Hemisphere 2-year-olds. h. The maximum initial rating for a maiden Griffin that has been placed second, third or fourth will be 60, and that for a raced but unplaced Griffin will be 57.
i. All unrated Griffins will be allocated a rating at the end of the season. j. Griffins which are unraced at the end of the season will be allocated an initial rating of 57 (Northern Hemisphere-bred) or 52 (Southern Hemisphere-bred).